A couple of months ago I published a post called ‘Are you a piler or a filer?’ In it I compared my experience of going paperless to giving up smoking; I have been trying diligently for a year, but still print out about 50 sheets a month. In response to my post Marek Martyniszyn (@Martyniszyn) sent me a long desccription of his working methods. Marek recently submitted his PhD thesis focusing on international aspects of competition law at the University College Dublin. For the 2012/2013 academic year he joined the Institute for Consumer Antitrust Studies in the Loyola University Chicago School of Law, where as a Senior Research Fellow he will be conducting research on the interface of competition and international law. The document Marek sent me was very long and detailed. I have decided to publish in two parts because I think this is valuable advice for anyone in the process of giving up the paper habit. Going paperless, or as I call it ‘working in digital’ is challenging, but the benefits are considerable, long-lasting, and exceed the costs of adjustment. Working digitally allows you to devote more attention to what is really important- ergo research, without having to actively manage books on shelves, folders in filing cabinents and footnotes on pages. Most of my friends and colleagues claim working solely on screen a no go because a monitor offers such a limited working space. The right software allieviates the problem of limited working space, but does not solve it. When writing an article it is by far easier to be able to have in front of your eyes the papers and sources you are refering to. This is probably why desks of academics tend to get so covered with materials of all sorts. Discussions surrounding going paperless usually focus on software, but I think the key is striking a balance between software and the right sort of hardware. One way to address the issue of limited working space on a laptop or desktop screen is to start using a tablet to view whatever article or other document you need at the time you are writing instead of printing it out on paper. This seems to work reasonably well for many people, but I don’t think it’s an optimal solution. I’m not against tablets, but I just think that getting one solely to use it with laptop is too costly and probably not as efficient as you think it will be. Instead of a laptop & tablet combination, I suggest you try plugging in an external monitor set as an extended screen. Essentially this creates two ‘desktops’. You can write on one screen, while viewing sources you use on the other. I recommend getting a large, panoramic monitor and placing it in a vertical position, so as to be able to view the whole page of a document on the screen. The key advantage in using a second screen is the ability to import text from the viewed source directly into the document you are writing. I found this alone gave me a major efficiency boost over using a tablet. It’s a small change, but makes a huge difference in practice: think about quoting, amending references and so on. This solution does not require data synchronization or reliance on cloud computing, which is the case with the laptop & tablet option. For those readers unfamiliar with such an arrangement, I should add that plugging in an external screen generally does not require any additional software. Under Windows 7 in the display preferences you can easily select the external screen and change its orientation from the standard landscape (horizontal orientation) into portrait (vertical orientation). The mouse cursor can be moved between the desktops via the left or right edge of the given desktops. I found this smooth and unproblematic. Mounting a screen on a stand is very simple. Most of the large screens on the market can be placed in a vertical position, but will not be equipped, by default, with a stand (a mount) allowing you to rotate it. You may need to purchase a stand separately; just make sure your monitor is compatible with such a stand (most are). I went a bit further and plugged a second external monitor to my laptop. This is a slightly trickier exercise since laptops usually have only one monitor port, but it is by no means difficult. I had to purchase a special VGA-to-USB adapter. That is a small piece of electronics of the size of a thick mobile with two wires. I plugged one into my laptop USB port; the other was plugged into a rather old monitor (hence the VGA port, but of course there are adapters for monitors using newer ports). The adapter itself came with some software which I had to install. The end effect is that I have been able to use my laptop and two external screens (see the picture to the left of my set up when I worked in Dublin), hence I ended up having three ‘desktops’. This greatly improved my experience of working in digital. I have my word processor on the laptop desktop, the source I was using at the moment on the larger external monitor in a vertical position, and my referencing software on the second external monitor. It all may sound a bit confusing, but actually it is very simple as you can see in the photo. 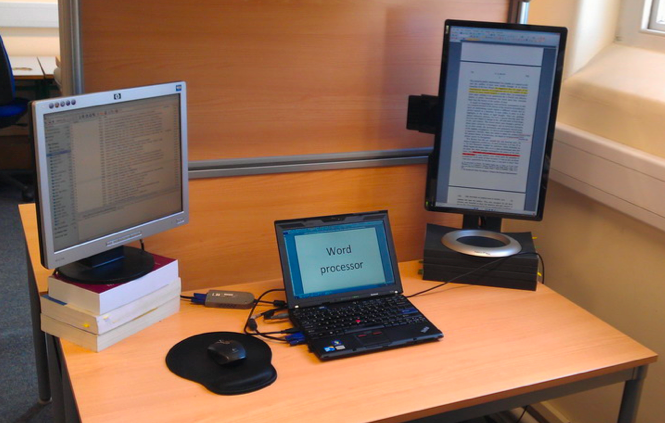 Using external monitors is a low-tech and inexpensive soltuion compared to using a laptop & tablet arrangement. At the same time I should acknowledge that the downside of using external screen(s) is that you will be limited to a particular location- an office, a library etc.- since you are unlikely to carry an external monitor with you (while you may carry a tablet). However, given that many academics tend to do most of their serious work in a single location, the lack of mobility might not be such a huge limitation. Thanks Marek! I hope this post has given you some ideas for configuring your workspace. If you have clever ideas for making workspaces more efficient – paper free or not – we’d love to hear about them in the comments. You can, if you like, put a picture of your workspace on the new Thesis Whisperer Flickr stream. This entry was posted in Getting things done and tagged going paperless, productivity, workspaces. Bookmark the permalink. yeah, unless you’re on a mac. Why would being on a Mac make any difference? I’m writing this on my external monitor connected to my MacBook Pro. The monitor is a relatively inexpensive ViewSonic. oh really? i thought all the mac monitors were really expensive. i’ve never seen any reference to non-apple monitors that are compatible. how much are those? or at least what’s the model? You don’t need a special monitor to use with a Mac; to my knowledge all are compatible. You must make sure that your graphics card can handle the resolution of the screen, but if your Mac is recent and you don’t buy a huge monster screen this will hardly be a problem. You will need an adapter cable. Exactly what type of adapter depends on which Mac you have, but for my 2011 MacBook I need a Mini Displayport to DVI cable that you can buy either for US$30 at the Apple store or for something like $8 at Amazon. thanks everyone! i see i’ve been misinformed. i’ll look into the extra monitor… one day. I have almost always been on Mac and absolutely any monitor will do. I have been using the two-screen set up for years and could not do without it. The paperless idea came to me while working in administration, I could not handle the amount of paper I had to archive every year. The investment in Adobe Acrobat and a second screen proved to be entirely worthwhile (I was on a PC at the time – 10 years ago). Although expensive, the academic option to purchase the software renders it way more affordable. I’ve been a Mac user for years, and have always had multiple monitors. It’s generally easier to get them configured than in other operating systems, and pretty much any monitor will work. The only thing you might have trouble with is some of those USB-VGA adapters (to plug additional monitors in via the USB port); but most of those have Mac drivers as well. You can also run a really wide monitor in landscape position and reduce the size of the windows you’re using. This way you can have a pdf (or two) opened next to the document you’re writing and just alt/tab to switch from one to the other. It’s also great for taking notes. What’s wrong with the laptop/tablet combo? My PhD has been paperless through necessity because I do so much of my work on intercity trains? I have found papers on the iPad while I write on my laptop to be pretty effective. I certainly haven’t needed to print anything in a while what with printer cartridges costing a squillion dollars plus your first born and all. I like the two monitor set up though! this is what i do. i needed the portability & discovered the helpfulness of the extra screen as part of the whole process. but the tablet leave you limited to one thing at a time, whereas a second monitor could potentially allow two+ more items open. so yeah, i get it. Love the three monitor idea. I presently work with two but use the big screen as my main screen and my laptop as the adjunct. Had to buy a cordless keyboard, but that’s cheap. Using the big screen as primary helps with eyesight and means if I write using Scrivener, I can split the screen in Scrivener and have virtually three screens (well almost). Agree about the ease of cut and paste this way, but sometimes I use the iPad for things I just want to read, although its a bit frustrating not having a direct connection between it and any of the other screens. Although I have not tried it, there are ways to add your iPad as an extra computer screen. http://arstechnica.com/information-technology/2012/07/the-power-of-two-using-your-tablet-as-a-second-monitor/ Adding an iPad, I can see a potential four screen environment coming up. That is super awesome – thanks for sharing! Looks like you’re well set up. I am just using my laptop, and I often open several documents at once and set them up side-by-side. That works for me, at least it works well enough that I haven’t felt the need to buy more hardware. I keep a stack of blank paper (old school notes with only one side printed) beside my laptop, so if I need to scribble something down I can do that. It’s a good use for paper that would otherwise be thrown out half-used. I profoundly disagree with this part of the rationale: ” Working digitally allows you to devote more attention to what is really important- ergo research, without having to actively manage books on shelves, folders in filing cabinents and footnotes on pages.” You may not be dealing with shelves or filing cabinets but you still have to actively manage your resources. In my experience I am much more likely to forget or ‘lose’ things which are on my hard drive than those which are on my desk. And while some people may be working in a field where everything is available digitally, for most of us, hardcopy books and journals are still a necessary part of the process. I can’t write a thesis chapter without printing it out. Not just for the proofreading, but also for the sense of structure and flow. Paperless obviously works well for some people, but it is not a one-size-fits-all solution. I have to say, working with two monitors is just confusing as hell for me. But actually, one is enough. When I have to re-structure a paper/chapter, I start a new document just for the new structure in bullet points. As for the research we need still being in print. That is sadly true. Though I’ve come to realize how much faster things go if you are able to scan and OCR the important bits. Not the least because you can have your pdfs always with you, if you need/want to work on a train etc. The one thing that I still need print-outs for is proof-reading. I can do it on screen but it takes much more time and concentration. When I’m at home I connect my MacBook to my standard television monitor (large amounts of screen space). Whilst I’m out and about I use an iPad and the iMessages feature for instant data transfer between the laptop and tablet. Going paperless means I can work from home AND still use my dining room table! I’m personally a fan of the multiple monitors + tablet arrangement. The tablet is for portability, and stuff gets synced automagically onto it vie Evernote and Papers. The big screen is my mail work space, and the small screen is for other things that are handy to have visible, but that you don’t want cluttering up your main workspace – Calendar, Evernote, chat windows, Twitter, etc. Another handy thing to have is access to a bulk scanner, so you can scan all the piles of papers that get handed out on a regular basis. I’ve been doing everything digitally since I started my part-time PhD two years ago, and it has made my life a lot easier. I agree 100% that screen space is the one thing you really need to invest in – working with a single laptop sized screen feels like performing keyhole surgery. Not only can one go completely paperless, I think its more important for one to go completely ONLINE. I also have a double screen setup and it works for most things, but I often need to scribble down some formulas, try do some working out and some sketchy diagrams. In order to alleviate this problem of once again having paper on my desk, I have started scanning or taking photos of my working out pages and uploading them onto my Dropbox in case I need them later. Occasionally I need to print something to edit, but as soon as I am done with the editting, I dispose of the pages. Make sure you have backups in your control though. If an online service goes belly up, you have no guarantee you’ll be able to get your stuff back from them. There have been a number of cases of online services losing disks or servers, being hacked, or just going out of business and customers losing the data that was stored up there in that cloud. I prefer my stuff up there in the cloud as well, but I try to be a bit paranoid. Luckily services like Dropbox and Google drive sync a local copy. I know where you are coming from, but these days the RAID functionality and backup procedures that those online clouds have are far superior than any back up system I am willing to implement on my desktop. With something as big as Google or Dropbox, their systems are designed to restore after server failures. The other trick I employ to ensure I do not lose info is to use multiple services layered (Not always clever, but this particular combination seems to work). So I have my thesis stored locally, on Dropbox and on a Subversion source control server. At the moment, I just ensure I have local backups as well as the online services – I don’t doubt that their backup systems are technically superior; it’s all the other factors that are a worry. Folks like Dropbox aren’t likely to lose my data to a disk failure; I’m more worried about them suddenly going out of business or being hacked, and my data no longer being accessible. Megaupload is the most recent example, or Distribute.IT. As a former IT support person in a Uni, I’ve seen too much PhD data and too many final draft PhD theses lost to various IT disasters to trust any one technology. This is probably the wrong topic for this thread, but I’d like to know more about Subversion source control servers. What are they exactly and why would versioning be different there from, say, taking a Scrivener snapshot? Subversion gives you a lot of powerful tools for comparing revisions, and for creating branches (so you can experiment with restructuring of a section, while continuing to make edits in the main branch, and then merging the branches later). Snapshots basically just give you the ability to go back and look at a version from a particular time. Proper source control is especially powerful when you have multiple people working on a single project. I use: external display (cheap cheap!) with MacBook Pro. Laptop is on a stand, so is at same eye level as external display. I will never go back to a single display. I also use an external key board, mouse and trackpad (very important for ergonomics, the Grad Student’s Worst Enemy – RSI is going to be a lasting legacy of this degree for me). The need to sketch, scribble, diagram, or just plain hand write is still really strong. I often solve many problems of logic or relationships or process by drawing. Add in a tablet or even a smart phone to the above mix and you have a way to do this digitally, no need to rescan later (try a stylus for fun with this). I write with Scrivener. Adding in drawn work is easy: e.g. sketch in any one of the note taking or even drawing apps, import via Dropbox into the Research Folder in Scrivener. I use some apps to produce the figures I need, e.g. Adobe SketchBook Pro. I have also scanned and digitized drawing stuff, especially when it becomes part of the work – e.g. graphics that require gutsier editing. I also use note taking apps to mimic the ‘pad of paper’ thing, to create text files that I import directly into my Scrivener project binder as part of the writing content. Index Card and iA Writer are great for this. If I’m thinking over a coffee in a cafe, I use these, esp. Index Card to do some of the meaty parts of my writing. And of course there’s always the option to turn the tablet into another display as noted in other comments. I back up my entire computer to an external hard drive, but I then also back up my thesis writing/key folders to one or more clouds, using a local folder. It’s redundancy. I read about some very clever ideas above. I decided to share mine in hope that some one may find it helpful. I am a graduate student so funds are constantly on the low side. Also, I have always wanted to switch to Mac but was never courageous enough to take the leap (the difference in price between PCs and Macs has always been a major hurdle). My solution to increasing productivity while being budget-conscious was the Mac mini. I have one monitor, keyboard, mouse setup at my university desk at this point but I am fond of using the BetterSnapTool app and the multiple desktops built in Mac OS X that help with windows organization. In addition, I have another monitor, mouse, keyboard setup at home. The Mac mini is very portable and I can easily turn it off, take it home, turn it on, and everything is the same way it was, including all of the apps and documents I had open previously, and in the same arrangement! I know this system has drawbacks but I believe it is the most affordable. I would like to increase the number of monitors I have in the future. However, as I rely on the university surplus service, I am patiently waiting until there is something available. Ok, this looks cool, but can someone please explain to me how you get your monitor to stand up in portrait mode?? I’ve done this in two ways. One is buying a monitor that allows the screen to be put in either position. I have a Viewsonic that can do this. The other way is simply to remove the base and either getting a monitor stand and attaching the display vertically or, as I did, placing the monitor vertically on top of some books leaning against the wall. In any case, you then need to tell the OS to rotate the image 90 degrees. On a Mac you do this in the display settings. Phd’ers should consider if they have ethical clearance to store phd research information (for example, interviews) on cloud services with servers located overseas as thus subject to other legal jurisdictions. Our librarian suggests treating your digital files like your paper ones – have a big clear out every once in a while- delete stuff, reorganise etc. Mac’s have an option for creating smart folders, which can be handy if you want your file to appear in more than one folder.